Anthropology Research Team member Anna Stammler-Gossmann sends warm greetings from the very cold Sorvaranger (Finnmark, Northern Norway). Warm greetings from one of the most beautiful places of the Varanger fjords, Gandvik (Javravuonna, in Sami) in Northern Finnmark (Latitude/longitude: 70°00′38″N 29°07′22″E). It’s good to know what’s really going on in the big world around us. It is especially cold when you in the open fjord or in the harbour. Now I know so much about the fish which we consume from time to time. As part of my fieldwork here I examine northern aquaculture (ACCESS project – Arctic Climate Change Economy and Society). Today, I joined a small team on the Gandvik farm to check the Salmon open net pens (cages) in the fjord. We went by boat to visit a total of 14 operating pens, where fish was caught and inspected by veterinary. Salmon farming in the fjords is not only matter of business and surrounding marine environment, but also has recently emerged as an issue point of accommodation of local and indigenous rights in using marine resources (see Camilla Brattland. 2010. Mapping rights in coastal Sami seascapes. Arctic Review on Law and Politics, vol. 1 (1): 28-53. Winter is the time when salmon fish does not required much feeding. However, it is hard work for the team to operate the big farm with just a few workers, working in 14 days shift. 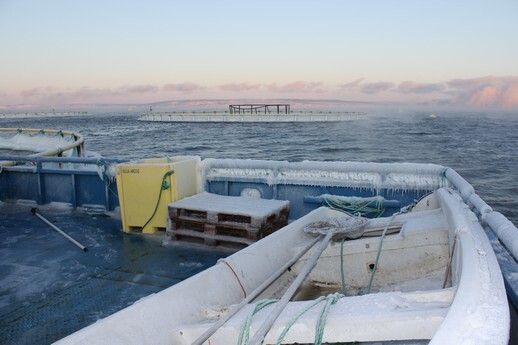 Today, we spent many hours on the boat exposed to strong cold winds and a temperature of -20 C..
We also visited the office on an offshore platform, where the fish are monitored by video cameras and fed. In the last few days, I had the opportunity to visit the fish processing plant in Jakobsnes (another fjord), to which the fresh fish from Gandvik is delivered to. 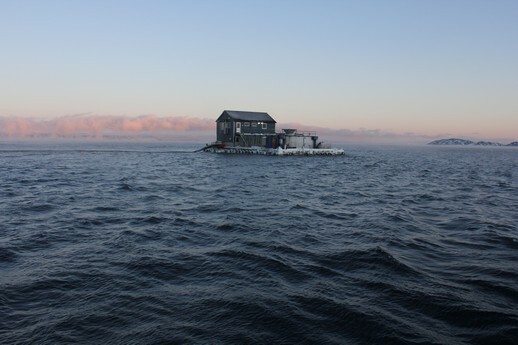 Another type of fish farming in the Sør-Varanger area is land based farming using round tanks in the Bøkfjord. My visit to the farm was a great opportunity to learn more about raising Arctic Char and even taste the quality of the ‘farmed’ version of this species of the Arctic coast. See here for a video of this setting. This entry was posted in All, Fennoscandia, Fieldwork and tagged fishing. Bookmark the permalink. At the department for Anthropology in Oslo they have a project on Aquaculture, which may be worth following for this kind of research. Maybe they have published already some articles? It’s called Newcomers to the farm (http://www.sv.uio.no/sai/english/research/projects/newcomers/). 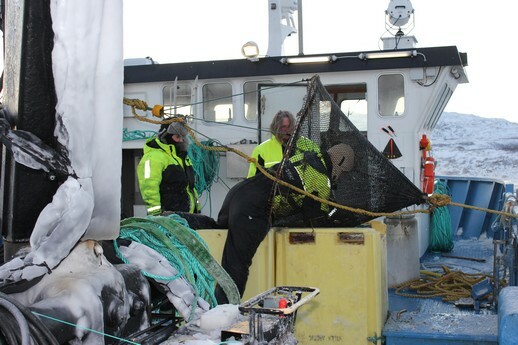 There is also this Professor Harald Beyer Broch at that department, on whose website it says “He is presently working on material collected during a 15 month long fieldwork among fishermen along the cost of Norway’s Nordland region. Research topics are: What creates sustainable local communities based on the fisheries, recruitment to the profession of fishing, the fishing boat (“sjark”) as a workplace, and attitudes towards and use of natural resources. “. Maybe useful to follow up what come out of this (http://www.sv.uio.no/sai/english/people/aca/haraldbb/). On the other hand, I am not sure if this sort of material goes easily together with the indigenous nomadic fishing field evidence that we have e.g. in Yamal, West Siberia. That material goes also together very well with sustainable communities, with relations among people and their states, but fishing there is much more than a profession. It’s a livelihood, entailing all sorts of spheres including the spiritual, and it’s situated in this multiple subsistence practices field, where each practice has its niche, and people creatively navigate between such niches. I’ve written about this a bit in the last chapter of that edited volume “good to eat – good to live with” (with Hiroki Takakura 2010, http://www.arcticcentre.org/?DeptID=12679).